Aloe Up Pro Cream SPF 30 contains UVA defender AVOBENZONE. Avobenzone (also called Parsol 1789) is an ingredient well know for its ability to absorb the UVA sunrays. The combination of this ingredient with the current formulation results in a broad spectrum UVA & UVB protection sunscreen. 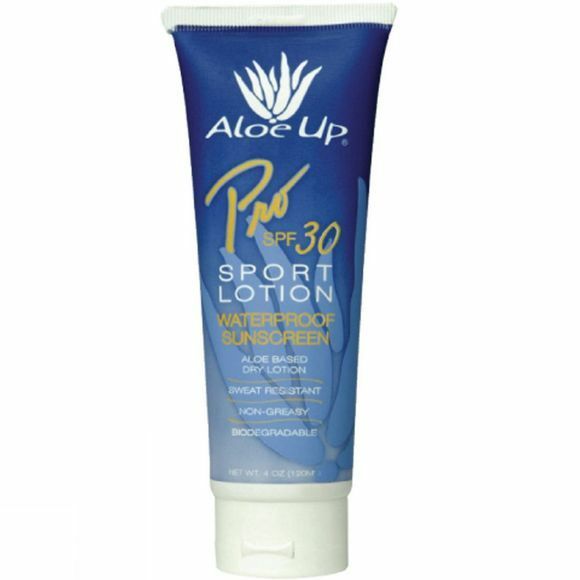 Aloe Up's Pro Sport sunscreen was designed for serious athletes who demand a technical product for extreme conditions. Pro Sport's unique dry lotion formula combines a 35% Aloe Vera Gel base with four active sunscreen ingredients and a non-water-soluble emulsifier. The non-greasy formula soaks into your skin so you can't feel it on. The sun cream is water resistant up to 80 minutes meaning you can swim without the fear of burning.